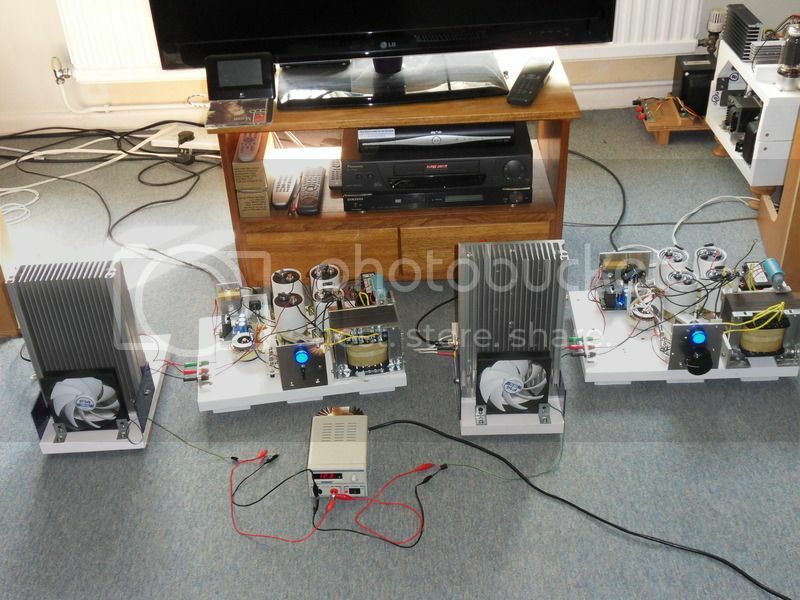 I tested the PSU the other day, and got 60v as predicted. However, I had a problem with the four 22000uf @ 63v caps. They were 2 pairs in series, with both pairs in parallel to give 22000uf @ 126v. 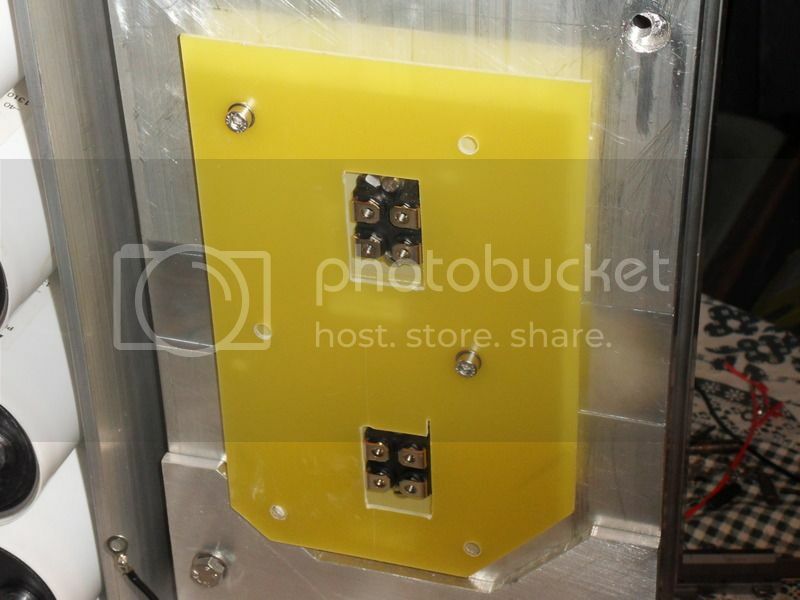 But unknown to me, the mounting studs are connected to the negative terminal so the first balancing resistor was red hot and the second one stone cold. Anyway, I've got some M12 nylon top hat washers coming so the mounting studs will then be insulated from the mounting bracket. The nylon top hat washers solved the problem, and plastic nut covers are an extra safeguard. I'm sorting out the 4.7v bias supply this morning, and next job is to cut and mount the FR4 board to hold the circuit components. Any photos to see your work in progress, great to see a build in it's different stages. The two mosfets (one is the power supply load -CCS) and the FR4 circuit board. And the bias module being tested. 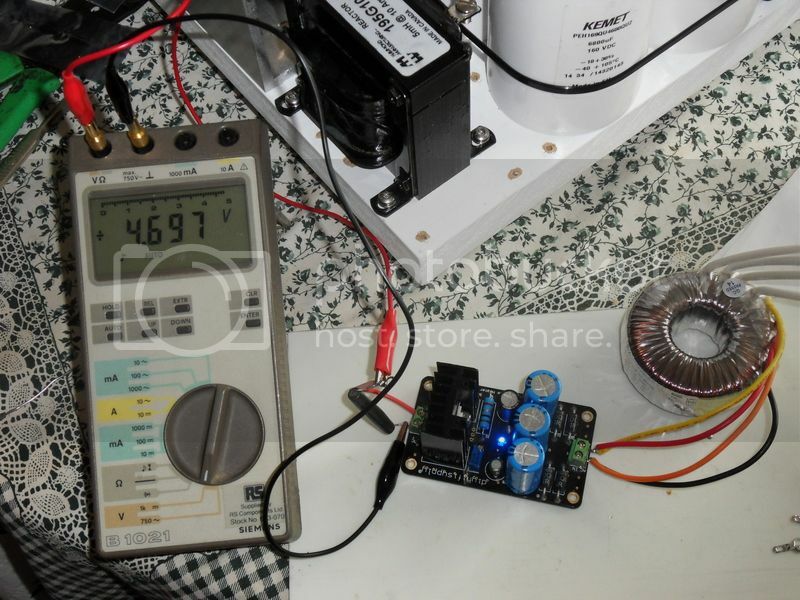 Target voltage is 4.7v. I have some resistors coming in the post tomorrow, then I can lay out all the components on the board, and mark out where to fit the turret tags. Further progress on the circuit board. Just waiting for a 2.7mm drill to arrive then I can fit the turret tags. The heat sinks, big as they are, are too small to use with convection cooling. On test, getting the bias setting right to attain the correct test voltage proved difficult, as the heat sink temperature was affecting the reading. I've borrowed a big fan to cool the heat sink and that made things much more stable. I've got a plan for a permanent cooling solution. 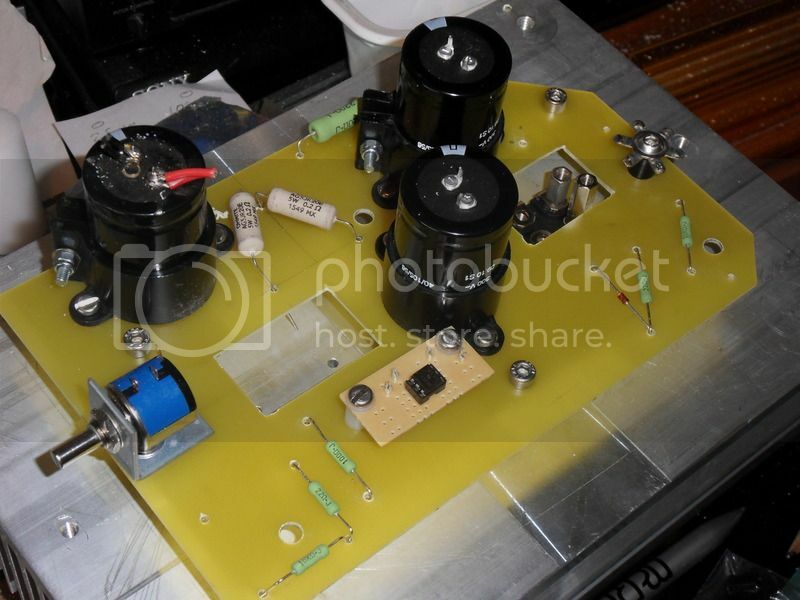 The original breadboard base was rather crowded, and the input transformer was picking up hum. So, I've made up a secondary board for the heat sink, circuit board and input transformer, and spaced out the power supply on the original board. This is work in progress, but I hope to have something finished and in working order tomorrow. The first test with a source and half decent speaker was encouraging, despite the hum. The secondary board has been finished, so the original board is just power supply. I've jury rigged the connecting wires, but it works, and the hum/buzz is much lower now. Sound quality in mono (one channel), with sub optimal source and speaker, is most encouraging. Just got to build the second one now. I'm now trying a 140mm computer fan and 1st test indicates it will do for the time being. Not sure how it will cope with high summer ambient temperatures though. Just got to make a proper bracket to hold it now.